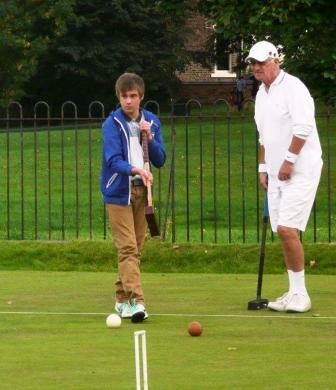 We enter teams in the Yorkshire Federation Association leagues for both short lawn croquet and full lawn croquet. This pits York Croquet Club against teams from across Yorkshire, including East Riding, Ryedale, Sheffield and Huddersfield. We are also guest members of the Croquet North full lawn league which includes Middlesbrough, Belsay Hall and Newcastle, and in 2018 joined the Pennine League. Regional league winners go forward to a national competition, the Secretary’s Shield. We are always keen to do justice to ourselves in regional games, but the handicapping system means we are always happy for members of any level of ability to offer to represent York. We are also pleased to host two regional tournaments and two national tournaments – the Yorkshire Federation Short Lawn Tournament held on a Sunday in spring; the Yorkshire Federation Full Lawn tournament held over the first weekend in September; the Yorkshire Advanced Tournament held in the summer; and the York Open Short Lawn Tournament held towards the end of September. All four of these events are relaxed and enjoyable occasions.